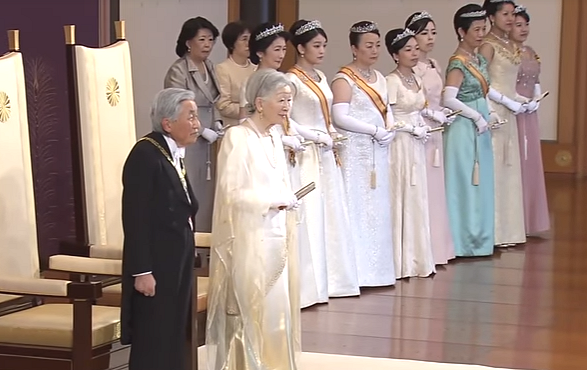 The imperial family of Japan gathered for their annual New Year receptions in Tokyo on Monday, and the ladies of the family appeared in their precise jewelry uniforms for the event. Empress Michiko hasn't worn tiaras for years, but she still brings out gorgeous jewels for the annual New Year reception. This year, she chose her multi-stranded pearl necklace with the beautiful golden decorative clasp on the side. She also wore golden earrings to coordinate with the necklace. Crown Princess Masako doesn't attend the public portion of the reception, but she does attend the private and family events. We caught a glimpse of her arrival in the car on the way to the event, and we can see that she's wearing the Pearl Sunburst Tiara and its matching mirrored necklace. The Akishino ladies in attendance were Princess Kiko, who wore her wedding tiara and jewels, and Princess Mako, wearing her diamond parure for the last time at the New Year reception. (She's getting married in November, and like all female members of the family, she'll leave the official imperial family afterward and become a private citizen.) Beside Mako is Princess Nobuko (Princess Tomohito of Mikasa), who also wears her wedding tiara and jewels. We didn't get a fabulous view of the other Japanese princesses present, so it's tough to precisely describe some of their jewels, but most of them generally wear the same pieces for these events. After Nobuko are her daughters, Princess Akiko and Princess Yoko. Next comes the Takamado family, including Princess Hisako (one of my favorites!) and her two unmarried daughters, Princess Tsuguko and Princess Ayako. Not in attendance this year: Princess Kako, who is studying at the University of Leeds, and the Princess Hitachi. Here's one more look at the lovely jewels worn by the Empress at this year's reception.